You don't make friends with salad. Generally a bad idea for something you are about to eat. If you make friends by accident, just close your eyes and power through. Eat that salad like a man. Ha! Dollars to bagels, that phrase has never been uttered before. Salads are easy. Fresh greens topped with fresh vegetables, maybe some fruit or nuts or seeds or cheese, and a dressing. Basically, salad is a pile of whatever fresh, ripe food you have in the house. I like my food in piles. I started with some arugula and spinach. I added some red pepper sticks, cucumber quarter coins, and tomato wedges. 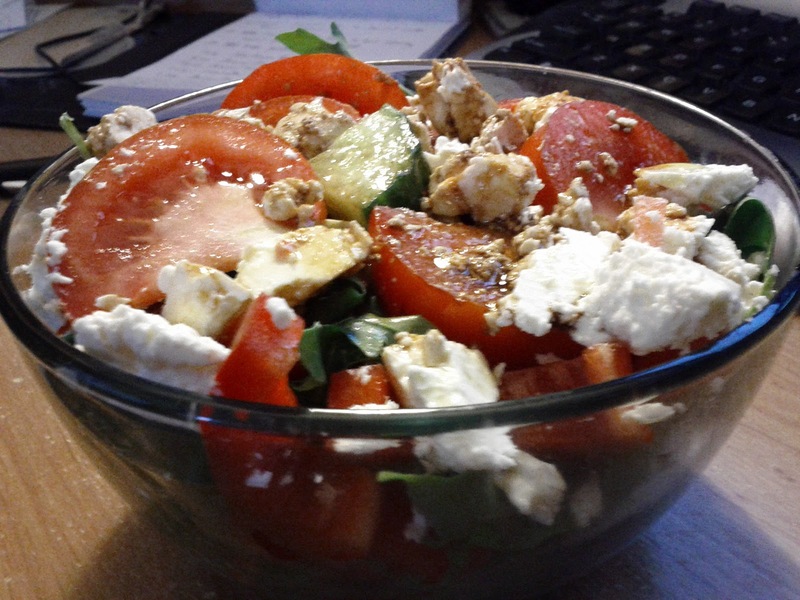 I tossed this around a bit, taught it who's boss, and crumbled some feta over top. For the dressing I drizzled a splash of olive oil, another of balsamic and a sprinkling of tamari (soy) sauce. Five minutes work, nothing to it. If you can avoid cutting yourself and ignore the screams of the vegetables, you can make a tasty salad.